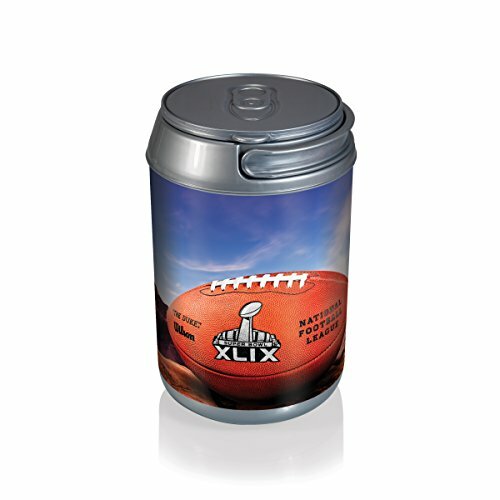 Great for picnic lunches, sporting events, outdoor concerts or a day at the beach, this Picnic Time NFL Super Bowl XLIX mini can cooler features a durable insulated construction that is designed in the shape of an oversized beverage can, with a wrap-around special event official logo design. Fun and functional, this can cooler holds up to 6 standard size cans and the hard plastic construction is sturdy, easy to clean and built to last. The lid is removable and the handle will fold to either side for easy access to what's inside. This unique mini can cooler measures approximately 7 inches in diameter and 11-1/2 high, with a 4-quart capacity.